Want a Fresh Financial Start? Our Financial Partners offer you the opportunity to open an account even if you had problems in the past. 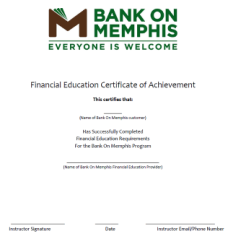 To open your account take your certificate and identification to one of our financial partners offering Bank on Memphis accounts. In most cases, Second Chance Fresh Start certificates can not be redeemed at the same financial institution where a previous account was held. And you are incurring substantial fees for overdrawing your account, writing bad checks or other problems. Click here to find available financial education courses. ​Click here to complete the fresh start workshop online.